A conservative dark money organization linked to billionaire libertarian brothers Charles and David Koch is refusing to disclose information about the size of its donations, defying IRS regulations that govern the tax-exempt entities. 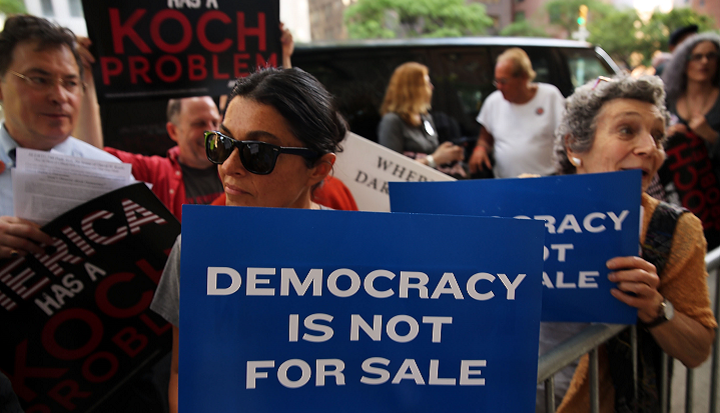 Americans for Prosperity (AFP), the flagship political organization of the Koch brothers, spent at least $13 million to help elect Republicans during the 2016 election. It raised almost $64 million in contributions, according to its tax return. The organization, however, last week formally rejected MapLight’s request to release a redacted section of its annual tax return that lists any donations of more than $5,000. MapLight, a Berkeley, Calif.-based money in politics watchdog, has filed a formal complaint with the Internal Revenue Service. The section requested by MapLight, known as a Schedule B, is an important document because it indicates how much money comes from large contributions. In November, MapLight used a Schedule B to report that the dark money organization that financed Supreme Court Justice Neil Gorsuch’s confirmation received almost 90 percent of its 2016 funding from a single $28.5 million donation. Under IRS rules, political 501(c)(4) nonprofits like AFP are required to make their full tax returns publicly available, although they are permitted to redact certain information — including names and addresses — that could be used to identify donors. AFP is arguing it doesn’t have to publicly disclose the size of individual donations it received in 2016 because the information might be used to reveal their donors. “AFP believes that disclosure of dollar amounts and/or non-cash property contributions could reasonably be expected to be used to identify the names of contributors,” Levi Russell, the organization’s vice president of public affairs, said in an email. Organizations including the U.S. Chamber of Commerce, the National Rifle Association, and the 45Committee, which collectively spent $85 million on the 2016 election, have not raised similar arguments. “IRS regulations are clear that 501(c)(4)s must publicly disclose their complete 990 upon request, with the names and addresses of the top contributors redacted,” said Brendan Fischer, an attorney at the Washington, D.C.-based Campaign Legal Center. In their 2012 tax form — the last publicly available one that included a redacted list of contributors — AFP reported $115 million in revenue. More than $89 million came from large grants of more than $1 million, including individual grants of $21 million, $26 million, and $11.5 million.